Posted by plassaaj on Friday, October 31, 2014 in Big Data, Informatics / Big Data, Neuroimaging. Medical imaging analysis processes often involve the concatenation of many steps (e.g., multi-stage scripts) to integrate and realize advancements from image acquisition, image processing, and computational analysis. With the dramatic increase in data size for medical imaging studies (e.g., improved resolution, higher throughput acquisition, shared databases), interesting study designs are becoming intractable or impractical on individual workstations and servers. Modern pipeline environments provide control structures to distribute computational load in high performance computing (HPC) environments. 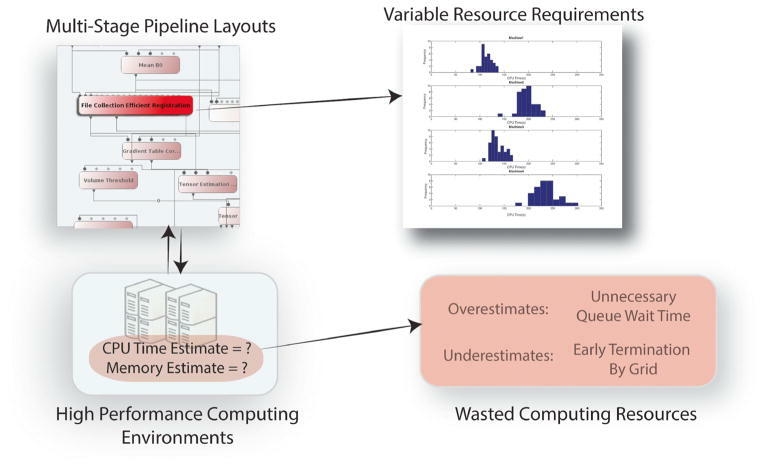 However, high performance computing environments are often shared resources, and scheduling computation across these resources necessitates higher level modeling of resource utilization. Submission of ‘jobs’ requires an estimate of the CPU runtime and memory usage. The resource requirements for medical image processing algorithms are difficult to predict since the requirements can vary greatly between different machines, different execution instances, and different data inputs. Poor resource estimates can lead to wasted resources in high performance environments due to incomplete executions and extended queue wait times. Hence, resource estimation is becoming a major hurdle for medical image processing algorithms to efficiently leverage high performance computing environments. Herein, we present our implementation of a resource estimation system to overcome these difficulties and ultimately provide users with the ability to more efficiently utilize high performance computing resources.